George Fuller alias George Orange is an eccentric clown, acrobat and dancer from Chicago who has been performing for more than 20 years. 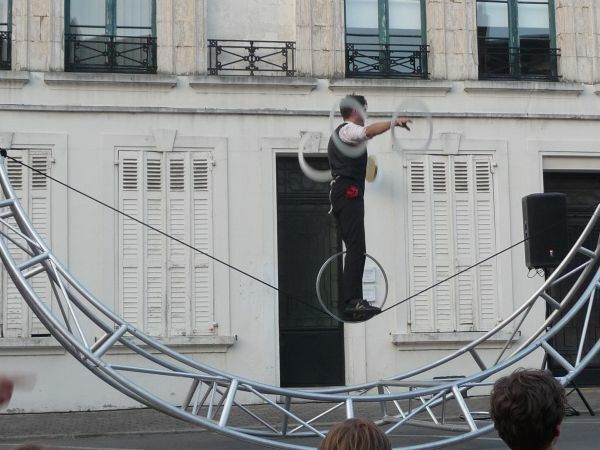 Street and circus artist, he has already collaborated with many companies throughout the world. Thanks to these experiences he has created his own universe…Often compared to Jacques Tati and Mr Bean, he makes unique shows up. This artist who has more than one trick up his sleeve seems to come straight from the Moon. In his show Man on the Moon, he has brought back a piece of it with him as he is having a walk on a crescent moon : a poetic and metallic device coming straight out of his imagination. George is truly one of a kind…take a trip with him is an experience not to be missed !